The proliferation of advanced weapons to volatile regions of the world has become a major issue in the post Cold War era. It was thought that no Third World nation could ever pose a technologically-based threat to the great powers by acquiring advanced weaponry. But this has proved to be wrong. The Persian Gulf War changed the worldwide perception of the spread of ballistic missiles to countries like Iraq. Access to a new type of weapon--cruise missiles--poses an even greater threat. With technology that is accessible, affordable, and relatively simple to produce, Third World countries could acquire highly accurate, long-range cruise missile forces to escalate local conflicts and threaten the forces and even the territories of the industrial powers. This book is a warning to policymakers. It is not too late to confront the realities of cruise missile proliferation and to devise international responses that could contain the worst possible consequences. 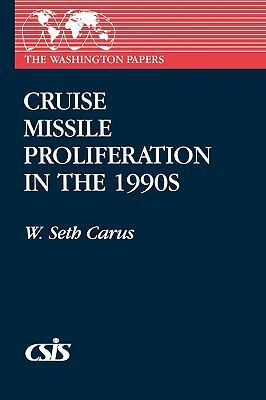 Carus proposes a new regime of technology controls, security-building measures, and conflict resolution that need to be considered, and acted on, by policymakers and international relations experts everywhere.Carus, W. Seth is the author of 'Cruise Missile Proliferation in the 1990s' with ISBN 9780275945206 and ISBN 0275945200. Loading marketplace prices 56 copies from $15.63 How does the rental process work?